Planned with a brief of maximizing views of the valley and enabling a nexus with the environment, the villa for a family of four has been conceived on a plot of land that is deeply contoured with a steep slope towards the valley. With stupendous views, where earth, water and the environment amalgamate to demonstrate nature’s phenomenon, the villa has been planned with most of the rooms optimizing the views. The natural site contours have been used effectively while exploiting the views of the mountains to create an infinity swimming pool that manifests itself as the core of the villa. 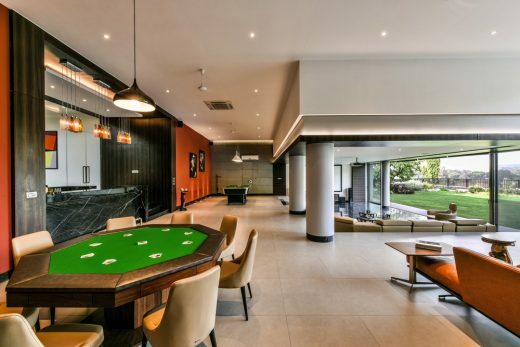 The area under the pool serves as a leisure zone of the house, the more semi-public zone where games and an entertainment area are functionally located, while opening out into a lush green garden. 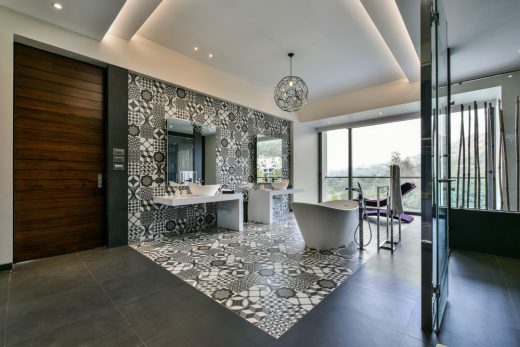 Molded with simplistic zonal principles of home design, the more public zones of the house such as the living area, guest room, kitchen, common guest room and the spa and Jacuzzi are all located on the ground floor. 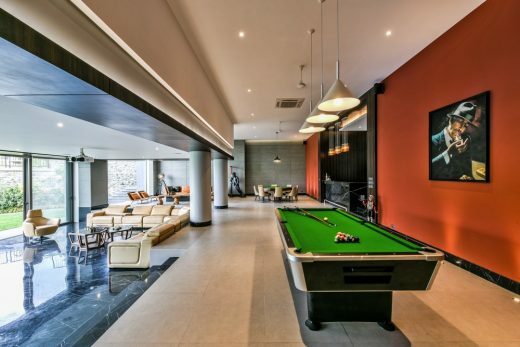 The first floor has 3 bedrooms, while the lower ground houses the entertainment and games area. The rooms on the ground floor and the first are all connected by a linear passage on the horizontal axis, which becomes the core of the spatial planning, driving the layout and the volumes of the built form. 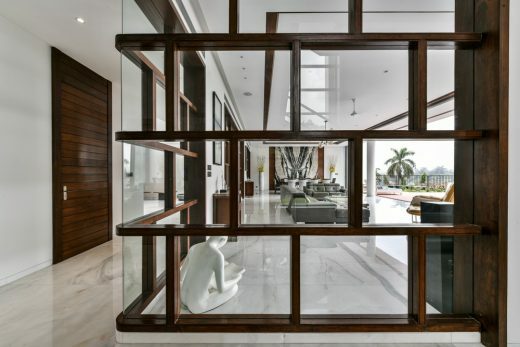 A glass and wooden screen separates the living room on one side and has 40 feet opening on the other facing the valley, creating panoramic views for the more public zone of the house. The language of the furniture here follows a modern palette with leather furniture, travertine marble table tops and a blue granite dining table top. 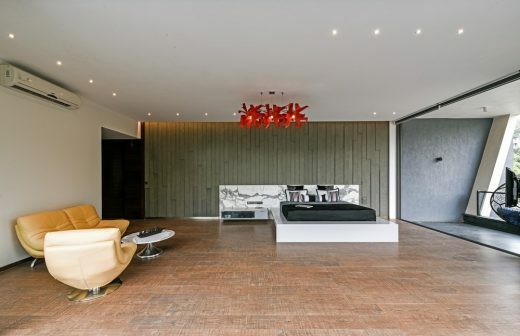 An interesting exotic Brazilian granite forms a feature wall in the living room. The master bedroom has a 13 feet cantilever projecting out which provides shade to the outdoor sitting beneath. On the first floor, the Master Bedroom is cantilevered partially over the swimming pool below and exploits the best views. 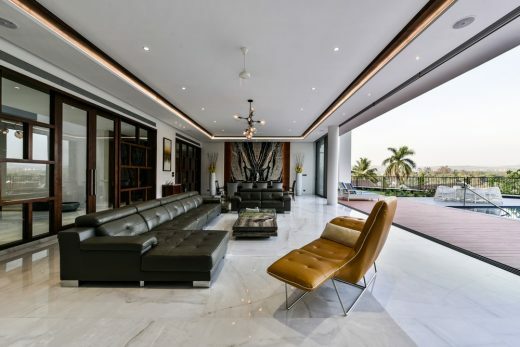 Conceived as a cantilevered block enclosed by a portal, which is interlocked with the living room extending beyond it, the volume enables the dynamism of the overall design. The interlocking of the three geometries creates an energetic design form that further enhances the vigorous aesthetic. 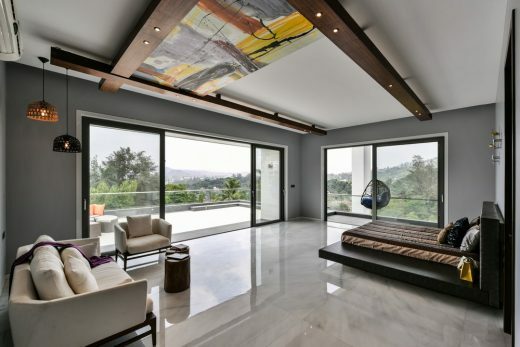 The son’s Room is a stark minimalistic combination of a patterned concrete wall, wooden floor and a large bed 7’ x 7’ with a satvario marble backrest. 2 sides of the bedroom have 11’ high windows opening out on a huge deck of 6’ to 15’ in depth, with lush green trees surrounding the bedroom. 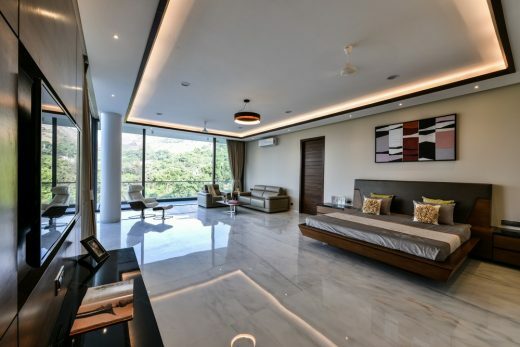 The daughter’s room opens out on a huge balcony which is open to sky and has a scenic corner view of the scenic Khandala valley. A painting forms part of the ceiling design, while the rest of the bedroom is simple with a leather platform bed. 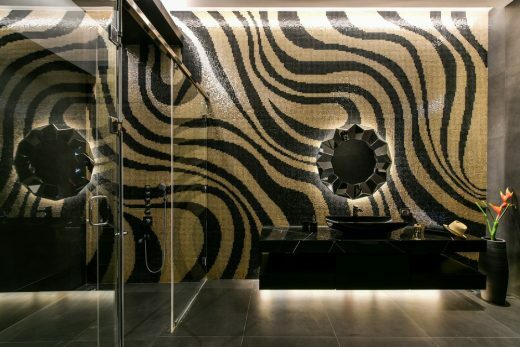 A bathroom sits next to this bedroom. It flaunts a free-standing bathtub, a wardrobe and a chaise lounge. 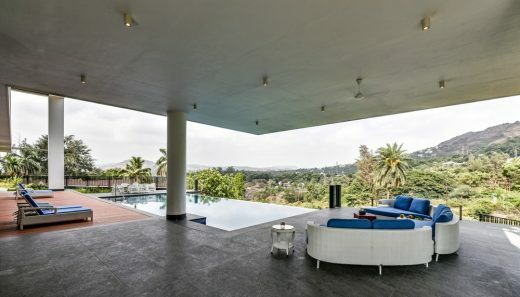 Such luxury of size and aesthetics could only be achieved in the countryside, away from Mumbai. 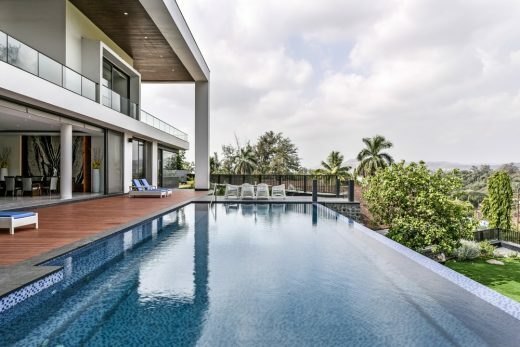 Keeping in mind that Khandala is an area of heavy rainfall, the construction is essentially done in brick and concrete. The walls are 9 inches thick to protect the building from heavy rainfall. 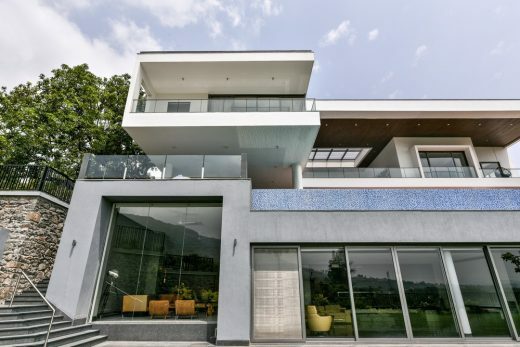 Large overhangs which also serve as decks protect the inner walls of the house from the heavy rains and the sharp sun during summers. 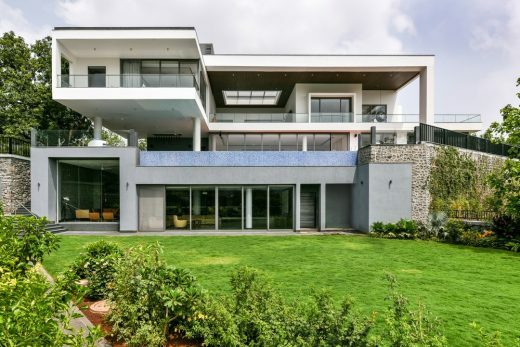 A Flat slab construction technique has ensued the seamless aesthetic, which further augments the openness and results in a visual connect with the outside greens. 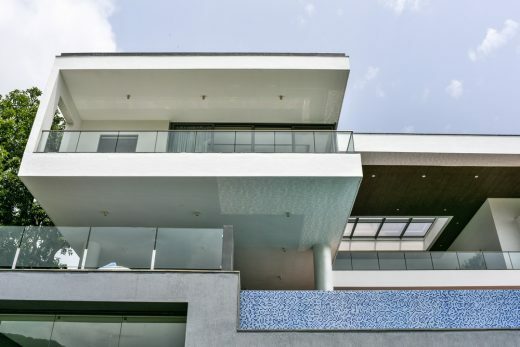 The design language of the villa is modern contemporary. 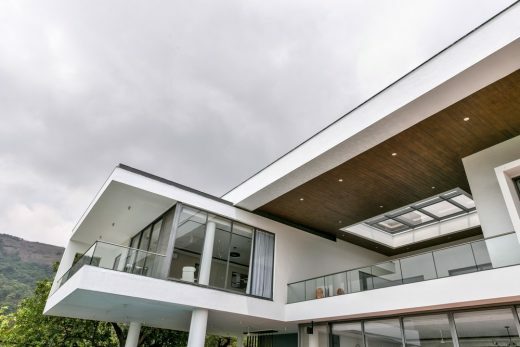 Both the exterior and interior walls are draped in white color. The flooring is finished in white lhasa marble. 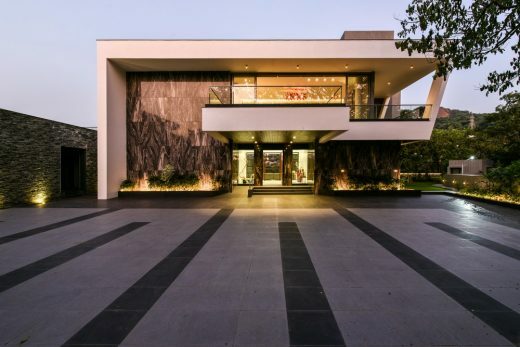 The whiteness of the villa on the inside and the seamless slabs without beams create a beautiful visual contrast and blur the boundaries of the inside with the lush green garden and foliage of the outside landscape. 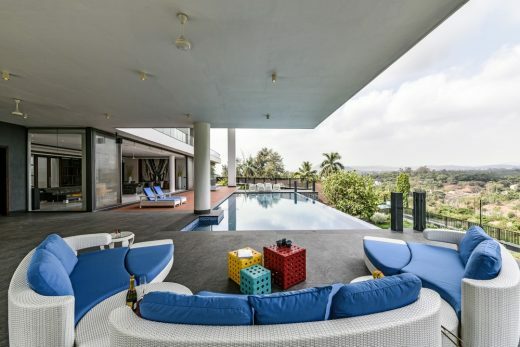 The beauty of the villa is the infinity pool which creates a breathtaking vista from the living area. An alluring view of the mountains is framed with a large portal thirty feet in height which partially covers the outdoor seating. A white marble staircase with indirect LED lights under the risers of the staircase leads to the lower ground entertainment area. The walls are of concrete with one wall in bold red. The area under the swimming pool is dropped and is treated as the theatre. 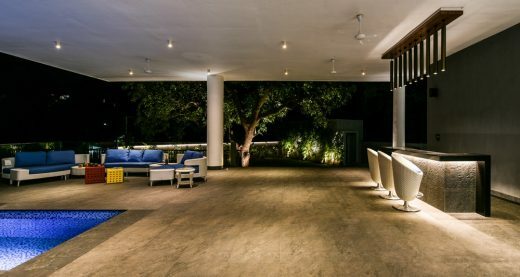 Raw wood center tables, quirky artefacts and a card table along, a pool table with a bar made of black marble form a vibrant entertainment area are some of the illustrious pieces of artwork. 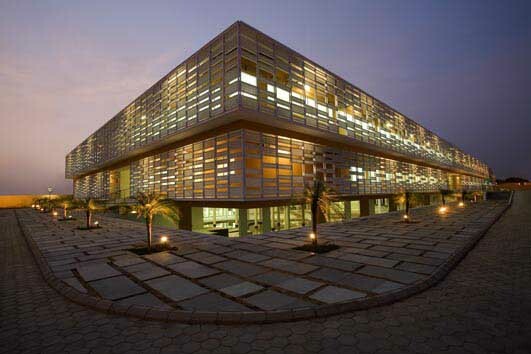 GA design is a multidisciplinary architecture & design practice based in Mumbai. 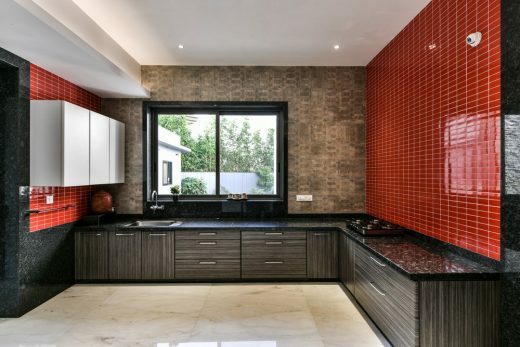 Founded in 1999 as Goregaoker Architects, a partnership firm of Rajan & Sachin Goregaoker, the work at GA design manifests creativity through well-choreographed architecture & interior design. At GA design, we craft services for Live, Work and Play. From multi-family residential communities, Luxury residences, redevelopment housing projects, to single-family luxury villas, workplaces and hospitality spaces, the studio’s portfolio is diverse. 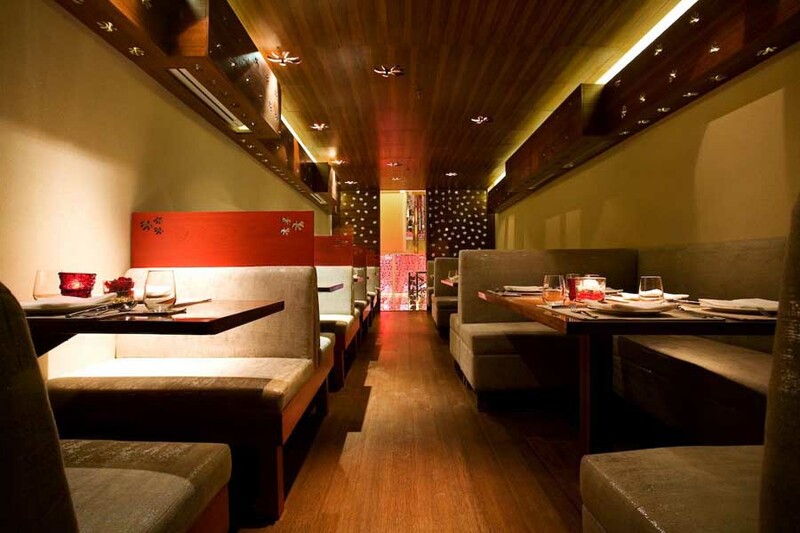 We strive hard to achieve the most appropriate, efficient and cost-effective, yet aesthetic solution for each scale. 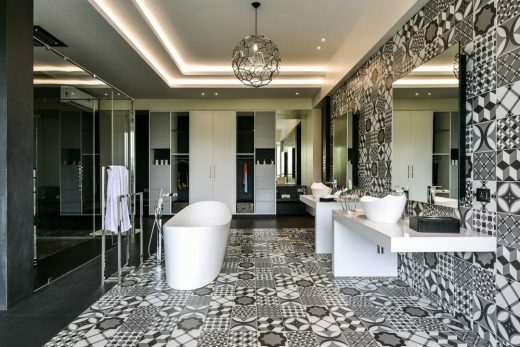 Applying no pre-conceived or stylistic notions, our approach attempts to enliven and enhance the built environment by means of our architectural and interior design services. Driven by programmatic concerns, contextuality, sustainability principles, cost constraints and community briefs, a collaborative approach serves as the inspiration. The Partners and Directors are leaders with individual domain proficiency, bringing together creative, technical, and management expertise to ensure the success of each project. The GA design team is a sundry mix of passionate, young individuals, who strive hard to innovate with design as a tool to cater effectively to client brief requirements resulting in architecture and design that stands the test of time. The Studio’s work has been published is renowned journals in India and abroad, and the principals are recognized for their work through many accolades. With a commitment to design excellence, artistic innovation, and sustainability, at GA design, we create buildings, Inside-Out.